Only a few studies have, till date, focused on the impact of private takeovers in India. Even though in sheer numbers, they are not as rare. This article attempts to bridge the gap by providing a rare insight into the impact of the takeover of a private target by an Indian public firm. Our analysis clearly show that the stocks of acquiring firm report a significant positive return on deal announcement. Various hypotheses have been analysed to classify the impact of various deal parameters in comprehensive announcement effect. The article would be helpful to the investors in Indian public firms to adjudge the impact of acquisition of a private firm on the returns of equity of the public firm. The Indian securities market was witness to over 2000 public takeovers during the period 1998 to 2009, while the corresponding number of private takeovers stands at approximately 9001. These figures clearly suggest that private takeovers are at least as major a part, if not more, of the Mergers & Acquisitions (M&A) activity, as public takeovers. Yet the takeover of private targets is a topic relatively untouched by researchers. The study of private takeovers first begs the question of its necessity and relevance, given the multitudes of studies available on takeovers in general. The world over, researches have almost unequivocally established the presence of abnormal positive returns for bidder firms in the event of a private takeover3,4,5. Thus, on one side we have greater bargaining power with a private firm owner that helps them command a higher premium for selling their firm. Market data analysis, on the other hand, shows that the investors perceive the acquirer�s gain to be more than this premium. The acquirer is hence, rewarded in the form of higher returns for the bidder company�s stock. Exhibit 1 depicts this irony. The study excludes pending or terminated deals. Deals in which the acquirer already held more than 74.5% stake have been excluded. Financial firms have been excluded from the study. $5 million was taken as the minimum deal size for the considered acquisitions to create a significant impact on the value of the acquirer firm. Deals in which the terms of payment between the acquirer and the acquired were not disclosed have also been excluded. Deals where the acquirer was an illiquid stock with limited availability of recent price history. 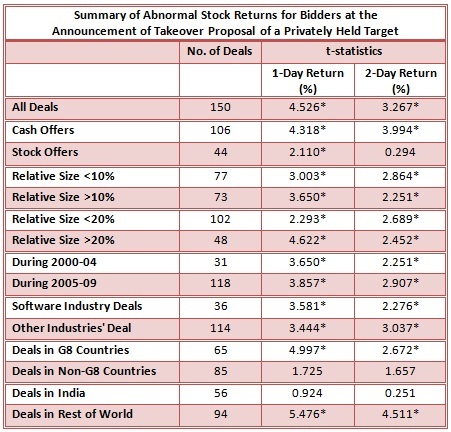 From an initial sample of 925 private takeovers, only 150 deals could satisfy the criteria. Summary statistics of the shortlisted firms have been listed in Exhibit 2. 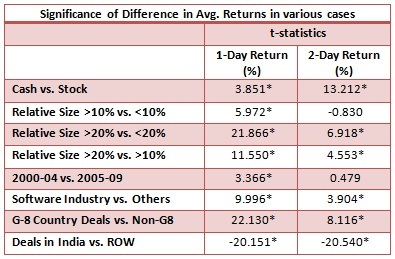 Both 1 day and 2-day returns have been calculated and tested to take into account the effect on stock of announcements made after trading hours8. In order to understand how the Indian markets react to the news of takeover of a privately held target by a public listed company, it is useful to take a cue from experiences the world over. The hypothesis formed therein when tested in the Indian context yield some interesting results. Exhibit 3 tabulates the results. It is evident that barring deals in non-G8 countries and India, the other classifications all yield significant positive abnormal returns for the acquirers. Thus, for example, takeover of private firms in an all cash deal yielded significantly positive abnormal returns for the acquirer. In addition, it is useful to do a quantitative study of the significance of the difference in returns under various classifications, as has been depicted in Exhibit 4. A positive t-statistic here implies that deals conforming to the first classification would yield higher returns for the bidder than those conforming to the second classification. As is evident, the deals, which incorporate cash payments, give significantly higher returns than those deals, which incorporate stock payments � indicating the value placed on liquidity by the seller. Likewise, the deals done in software industry by the bidders have resulted in significantly higher returns than in other industries. Terms of Payment: Target owners seem to value liquidity more; hence, cash deals yield significantly higher returns for the bidders. Size Matters: Deal size matters, but only temporarily � while acquisition of relatively larger firms gives greater returns on the first day, such size effects does not seem to sustain for the second day. Time of Takeover: The first time-period of 2000-2004 saw firms having greater abnormal returns. A look at the deal details shows that most of the deals were done either in the Software industry (post the dotcom bubble burst) or in the United States (after the 9/11 attacks). In both cases, the acquirer was able to buy out the firm at significant undervaluation resulting in higher returns for the bidder. This value enhancement is reflected in the significantly higher returns than those observed in the post 2004 period. Regional Classification: There were clear cases of acquisitions, done in developed markets, paying significant gains in the study. Acquisitions in G8 countries seem to fare significantly better, perhaps an indication of better price discovery in the developed markets � a fair price paid implies there is value addition left for the acquirer, which the market rewards in turn. Similar results seem to hold true for the comparison between targets in India and the rest of the world. Industrial Classification: Acquisitions in high-tech industries seem to have positive returns for the bidders due primarily to the presence of high-growth opportunities. Limited perception of the value of the target firm due to its operations being in a niche technology provides bargaining power to bidding firm, leading to positive returns for the shareholders of the bidding firm. Private takeovers and public takeovers are generally clubbed for all practical purposes, and not much attention is paid to their unique characteristics. 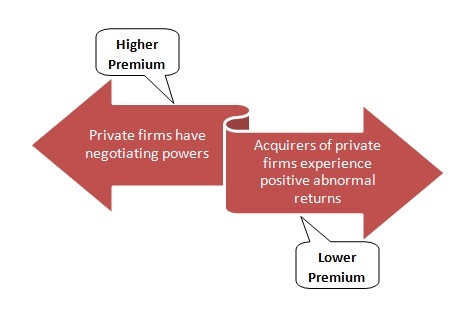 This study conclusively proves that private takeovers are associated with higher premiums as well as higher bidder returns, than are takeovers of public listed companies, and illustrates the key factors, which determine the bidder returns in such a case. Does this give a rule of thumb that can help companies choose prospective acquisition targets so, as to, maximise the bidder returns, or is there more to private acquisitions than meets the eye? Only time will tell.